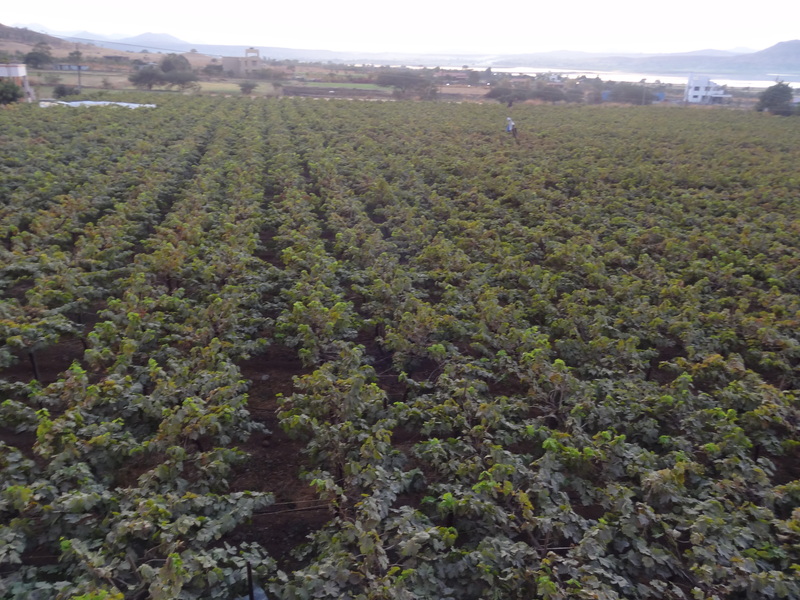 Last week I visited Nasik, a city about a hundred miles, and 4-5 hours by road or rail, north-east of Mumbai. I took a rickshaw from Bandra to Lokmanya Tilak Terminus, where I caught the train. For part of the journey I sat in a berth beside a family who were on their way to a wedding. They were keen to speak with me, and I had photographs taken with the two boys. The elder boy Sushmit gave me his email address and invited me to their home in Navi Mumbai. They were also getting off at Nasik, and Sushmit waited with me outside the station until my friend came to meet me. Sushmit thought that people would give me more hassle if he was not there, which was probably true, although even his presence couldn’t dissuade the stream of people offering taxis, directions and requesting money. We stood in the shade until my friend Parag arrived. He and I went shopping for fruit and bought watermelon, pomegranate and apples. Then we drove on to his home, where I met his family. They were all really lovely to me, and very welcoming and friendly, despite my two or so words of Hindi, and non-existent Marathi, which is the language they speak at home. After I had been introduced to everyone, Parag and I went out and met up with some of his friends. They took me to visit a temple. It is the first temple I have visited since childhood, and I was very glad to finally know what to do and how to enter one (you have to take off your shoes, and should avoid eating meat on the day you visit). We wandered around the temple looking in the alcoves at the shrines to the gods and goddesses, with my friends explaining to me about each of them. It was very interesting and I learnt a lot of new things, especially about Hanuman and Lord Ganesh. 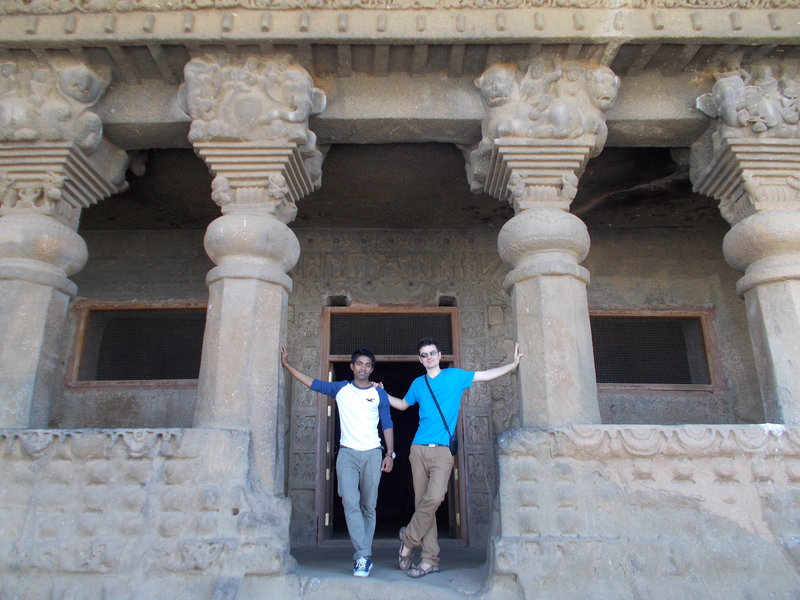 We drove to the sacred river that runs through Nasik. The water was completely dark, and the river there was straddled by low footbridges. A bright moon was hanging above the ancient part of the city, and we drove up towards it, through the intricate maze of narrowing streets. We passed very old houses and motorbikes, dogs and cattle, until my friends pointed out another temple. 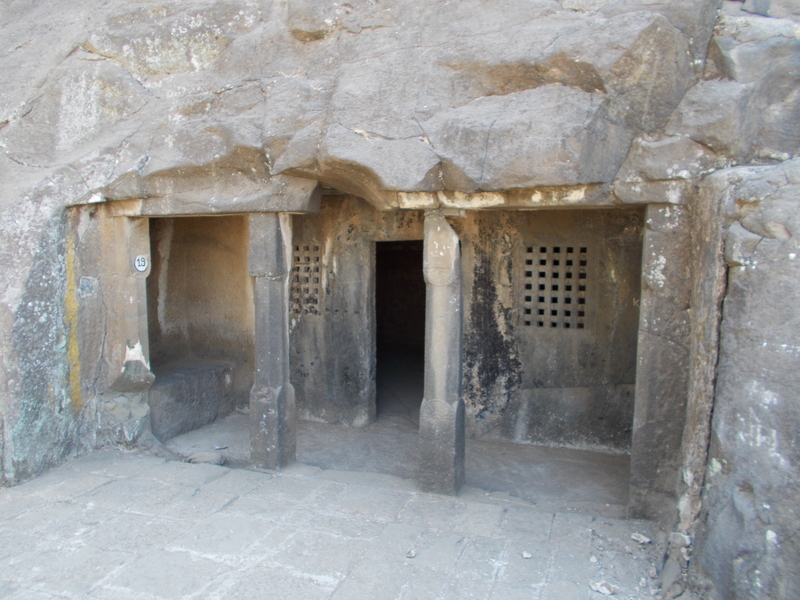 The next day we drove out of Nasik and went trekking to Pandu Lena caves, which are on a hillside. 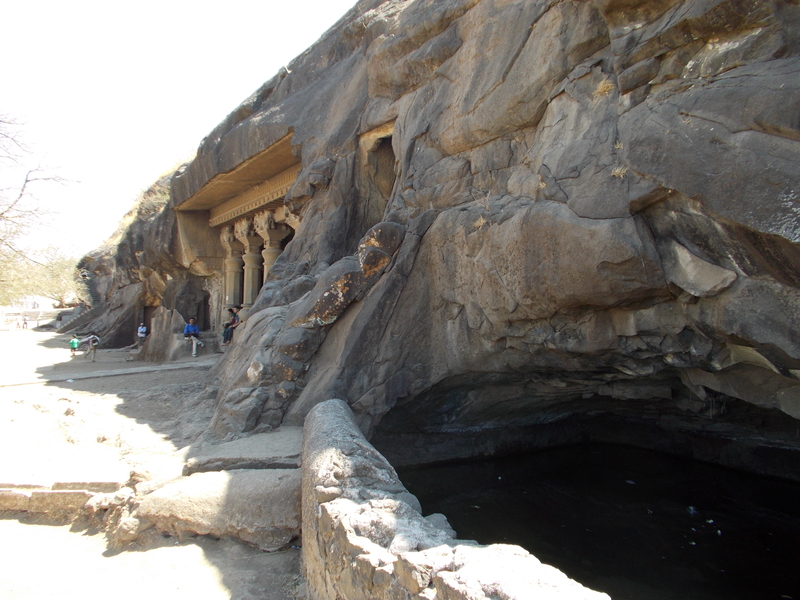 They are ancient caves, carved out of the solid rock. 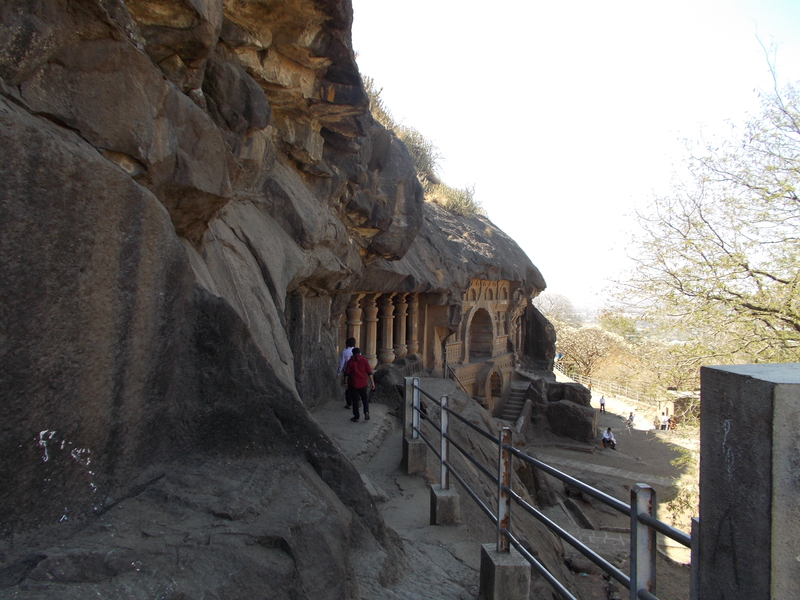 The caves are in a connecting network of passages and rooms, open to the side of the hill. We had to clamber up the hill to reach them, which was great fun, because we took the path without steps, using only the tree roots and each other to pull ourselves up the slope. There are several pools of water stored up in small stone reservoirs outside the caves, in order to provide for the people who used them. 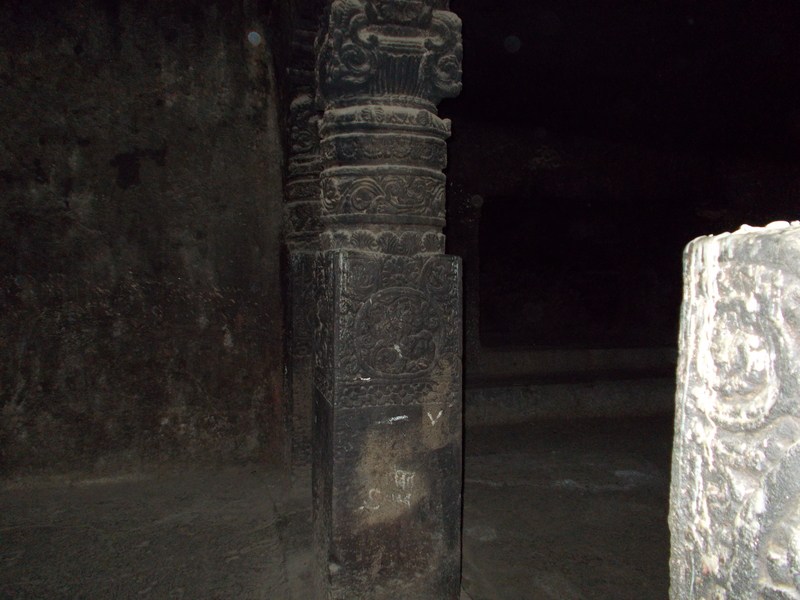 We wandered around the caves and passageways, exploring. 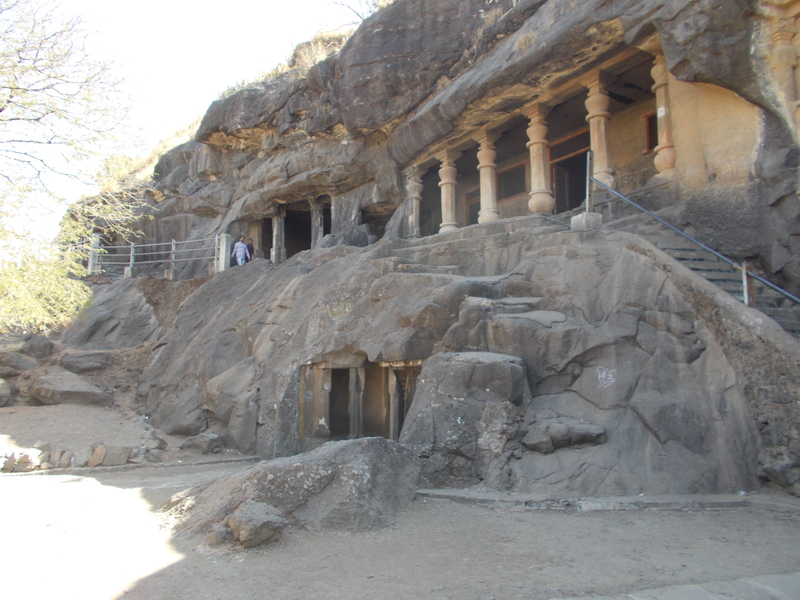 The Pandu Lena cave complex is more than two thousand years old, and the writing we saw carved into the stone above one of the caves was in the symbolic language that was the precursor of Sanskrit. Given its location on the important trade routes connecting the port of Bombay with cities in both north and south India, Nasik was a major city in ancient India, and is mentioned in ancient Indian literature. Archaeological excavation carried out at Pandu Lena shows continuous habitation in the area since the 5th century B.C. 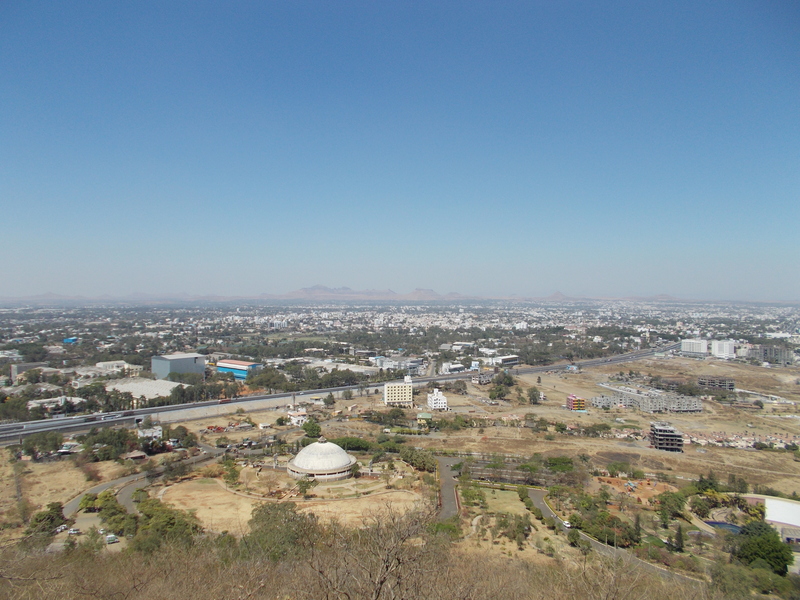 From the hillside where the caves were located we had a fine view out over the city of Nasik. 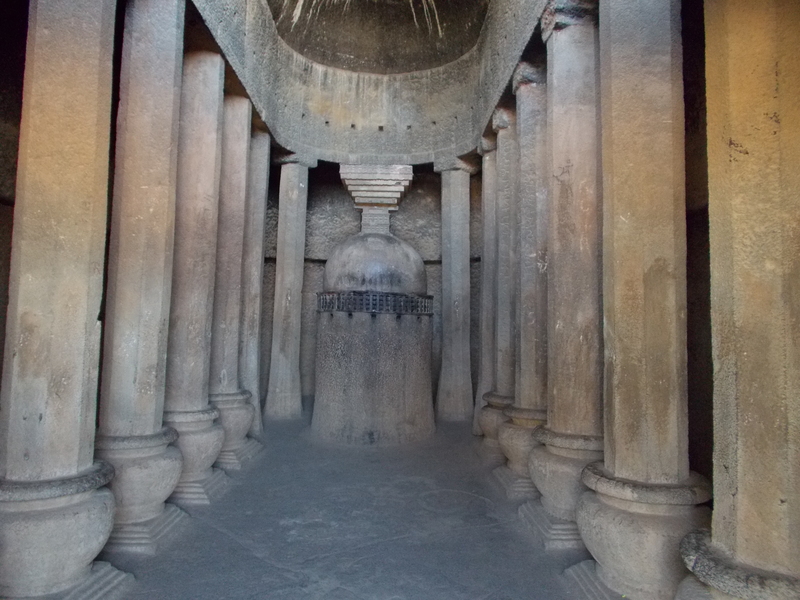 After trekking back down from the caves we went to the large mall in Nasik city centre. I had some ice cream dipped in mango syrup, which froze hard against the ice cream and formed a crunchy mango crust. We took rides on a mechanical rodeo bull, until we all fell off in succession! In the evening I was invited to Parag’s family gathering at the farm. There was a large group of his extended family, and a big meal. In Marathi tradition, men and women eat separately, and there were so many people needing to eat that everyone was fed in three phases. I was in the second group of men eating together in the barn, and we all sat on the floor cross-legged and ate chicken curry, chapatti, a tougher, thicker roti, daal, salad and rice. Parag was one of the people serving, going around topping up people’s plates and dishes of curry while they were eating. When most of that group had finished eating their meal, he came and sat down next to me to eat his own, and was served by men who had been in the first two groups of diners. We ate with our hands and for the first time I learned how to do this properly, by watching everyone else’s technique around me. My skills had been building during meals at Parag’s home already, but by this time I had become accustomed to it. After the meal I rinsed my hands under a tap outside, like everyone else. I found my shoes again, and noticed it had become cold in the darkness of the evening, since Nasik is in the hills. The barns were surrounded by fields of wheat, and after we had eaten, some goats came to finish the leftovers. The following day Parag took me to his office at the construction site where his father is building some apartments. They are very nice flats and very good value, about £20,000 for a two bedroom high specification flat – if any of my readers would like to consider living in Nasik! 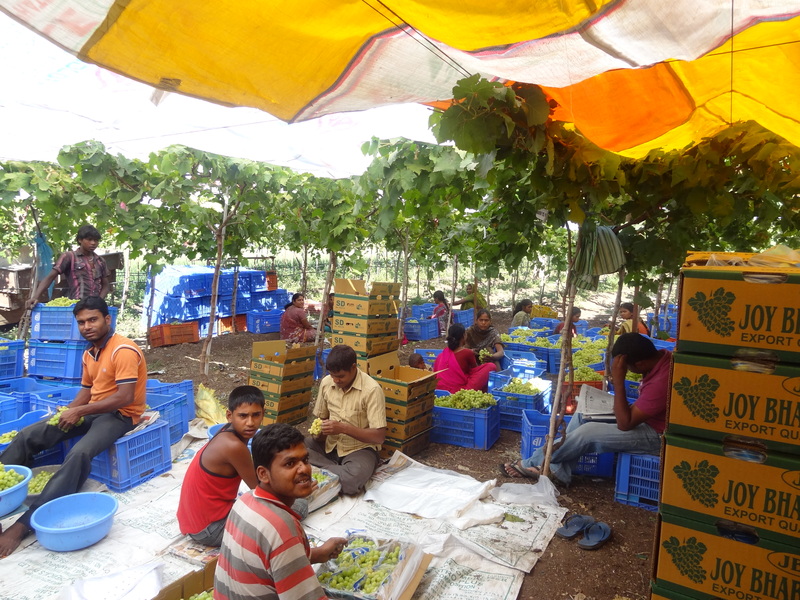 Then we went to Parag’s family’s grape farm. 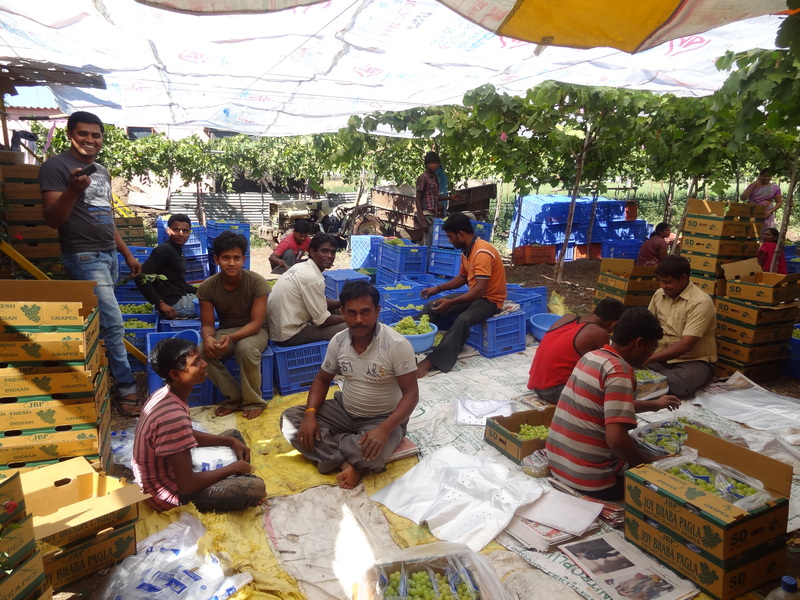 The first sight you see on approaching the fields is the groups of men and women packing grapes into boxes, and large columns of boxes of grapes standing around. 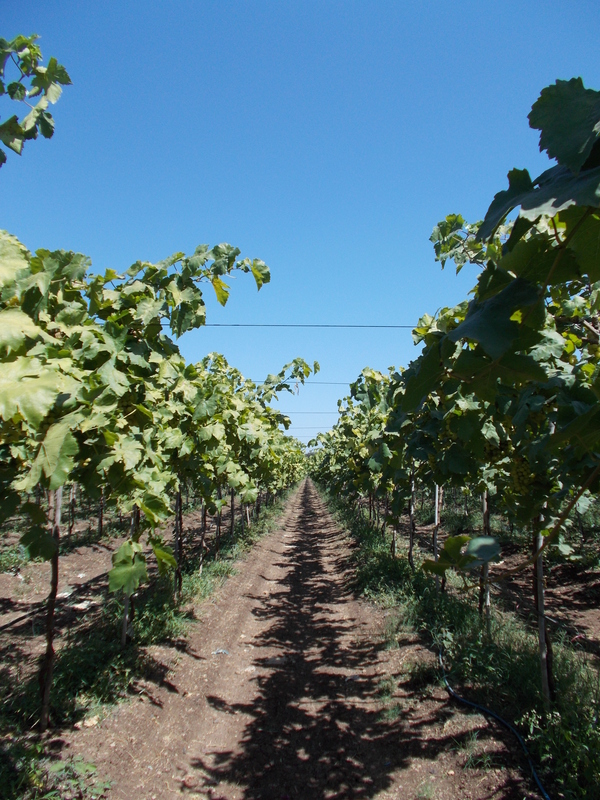 Then we walked through the fields in the sunshine, under the vines, eating grapes as we went. 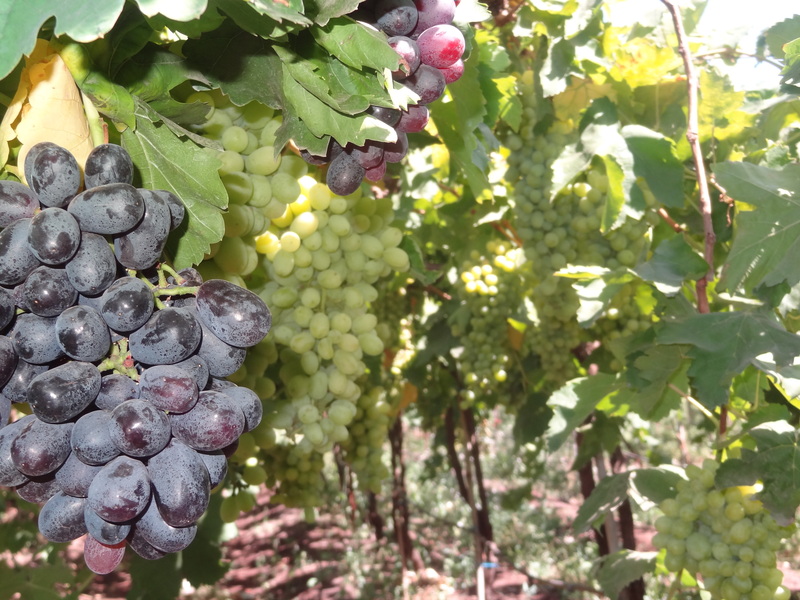 They grow a few different varieties of grapes, and both black and green ones. Everyone prefers the black. They are grapes for eating – as grapes for wine are smaller and not as sweet. 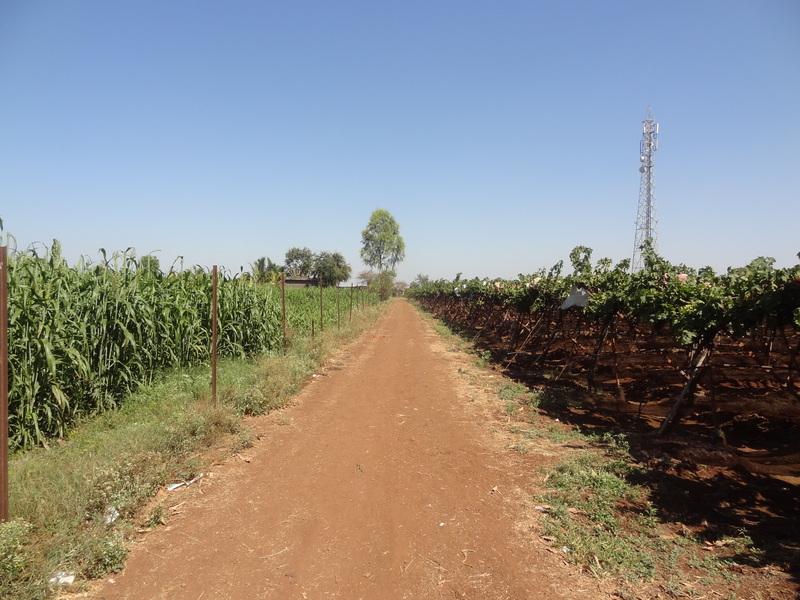 They also grow garlic, onions and some other crops in the acres they have on the farm. I loved to see the trees for tropical fruits growing wild there, the origin of fruits like mango, papaya, guava and lemon, which I never see normally outside of the supermarket, but which at the farm were just springing up out of the earth. 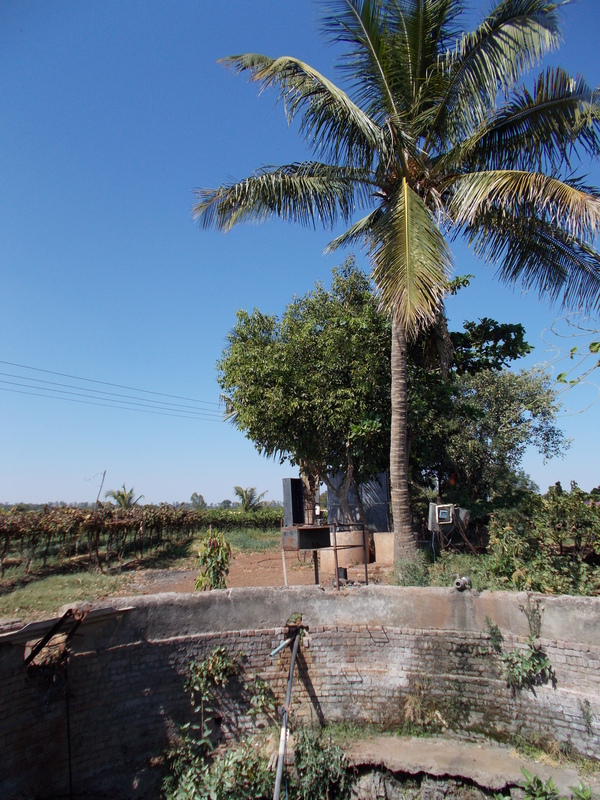 There are large deep wells that are used as a water supply. 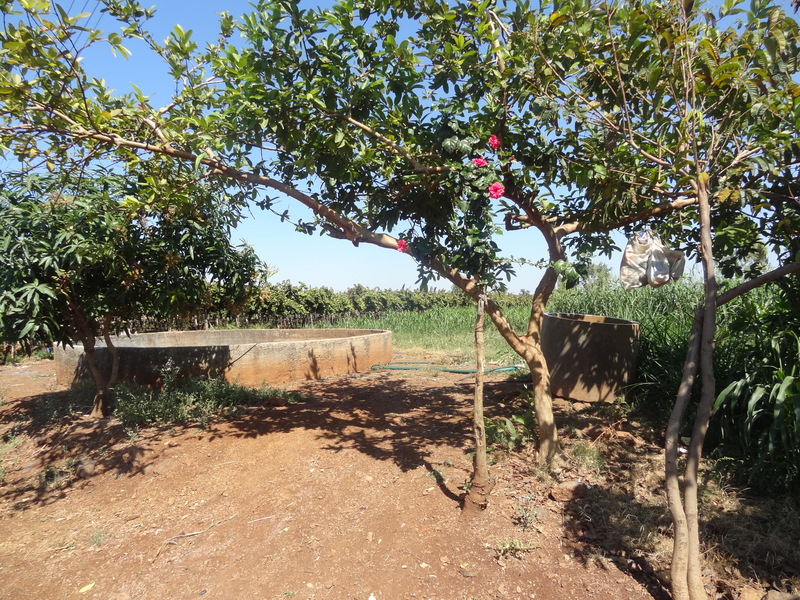 In one of these pits surrounding a well, Parag’s brother-in-law (who runs the farm) told me that he throws all the snakes he finds, so that deep pit in the ground is full of snakes. The very poisonous ones he gives to zoos. 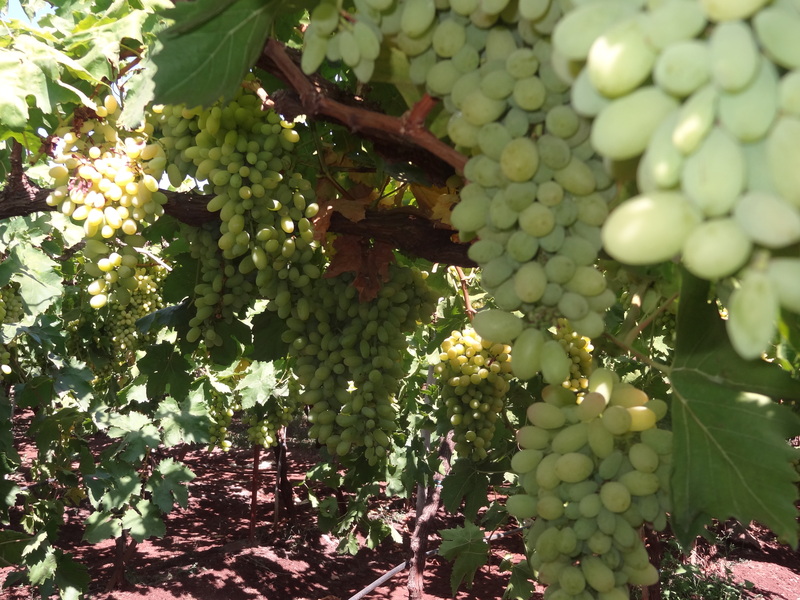 I was really enjoying the grapes, which were fresh, sweet, and warm from the sunshine. Parag’s brother-in-law gave us some green leaves to eat that were growing beside a well. After you eat these ‘magic’ leaves, you cannot taste anything sweet anymore. Parag and I chewed the leaves and absent-mindedly resumed eating from the bunches of grapes in our hands, but immediately they had turned as tasteless as ash. The leaves are apparently very good for diabetics, and I can see why. The effect only lasts for half an hour, but while it did it was very curious how completely the leaves changed the experience of the grapes. I also saw chickpeas growing, banana trees and green coconuts hanging high up on the palm trees. 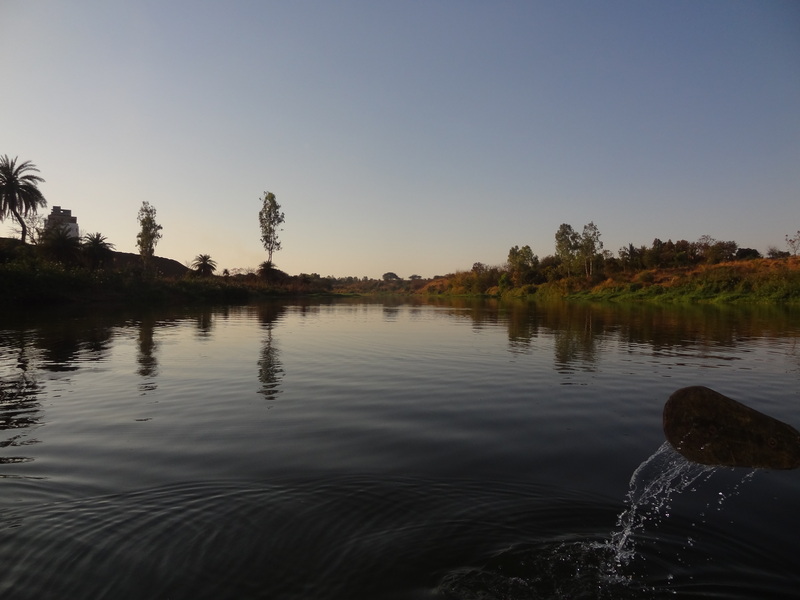 Next we went to the sacred river that flows through Nasik. With Parag and his friends, I entered a temple on the riverside, a temple full of vast clumps of bronze bells hanging from the ceiling, all of different sizes. 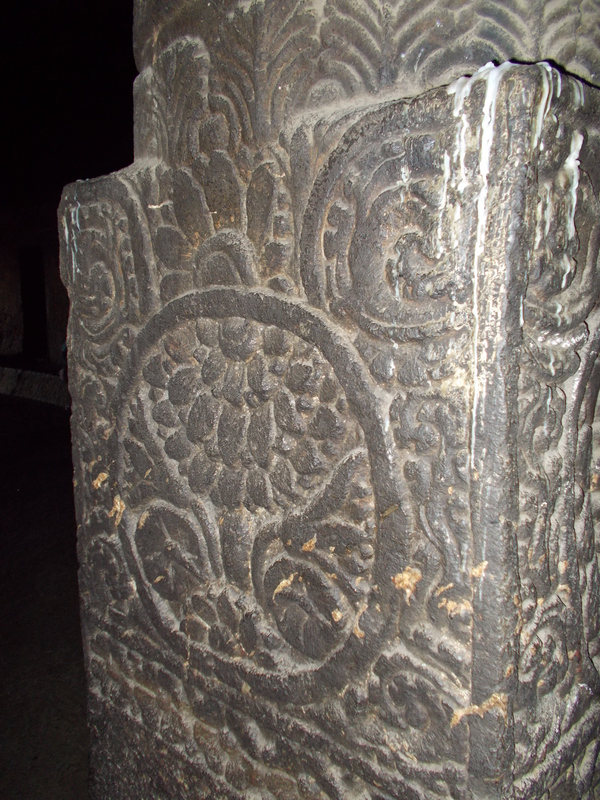 This temple was not enclosed in a building, but was outside, with just a few columns and roofs around the shrines. We had left our shoes outside the temple, and climbed down a slope to the riverside, and hired a rowing boat to take out on the river. 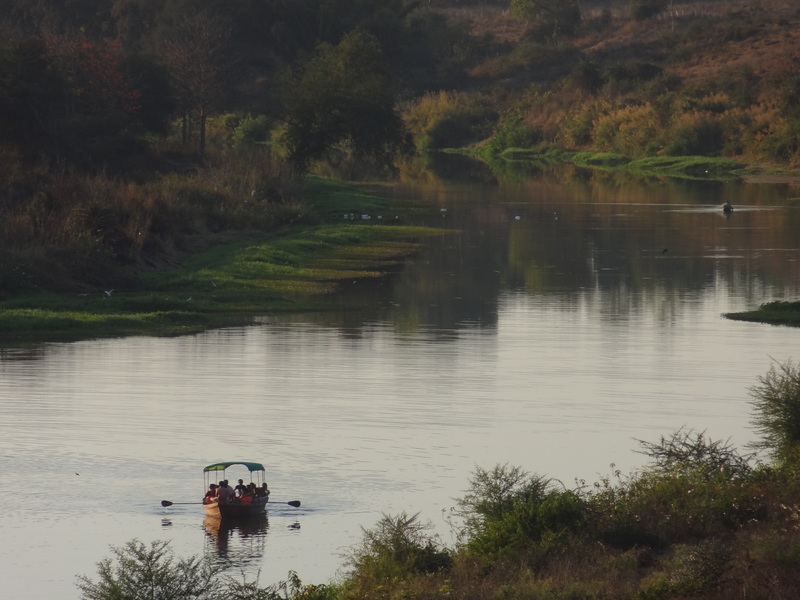 The river was very serene, and the sun was beginning to sink and the shadows lengthen. The calm water shimmered with reflections of riverbanks and sky. 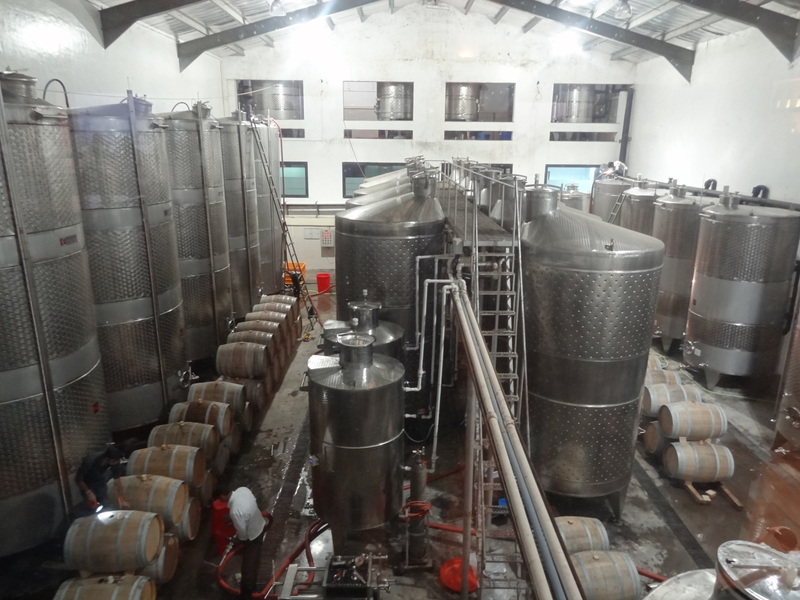 We went to the winery at Sula, which specialises in white wine. 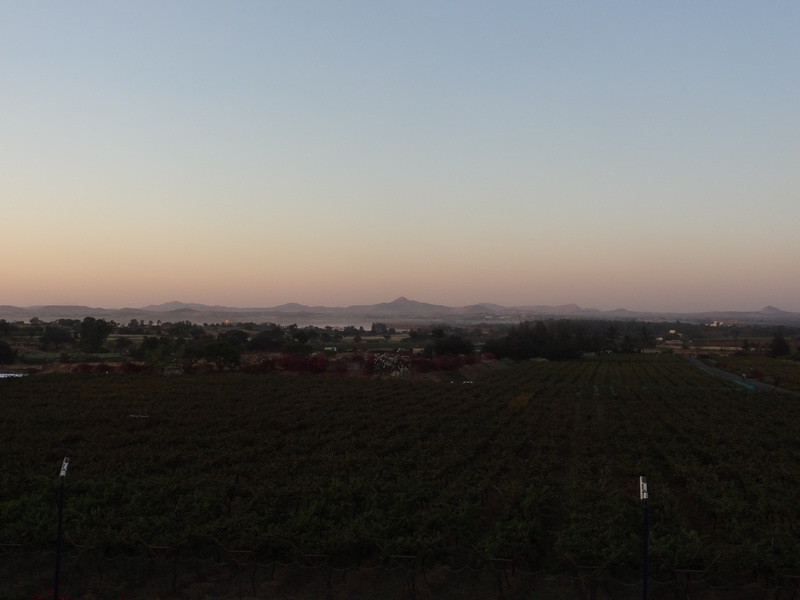 The winery is surrounded by vineyards, and when we arrived the sun was sinking behind a sandstone-coloured hill. 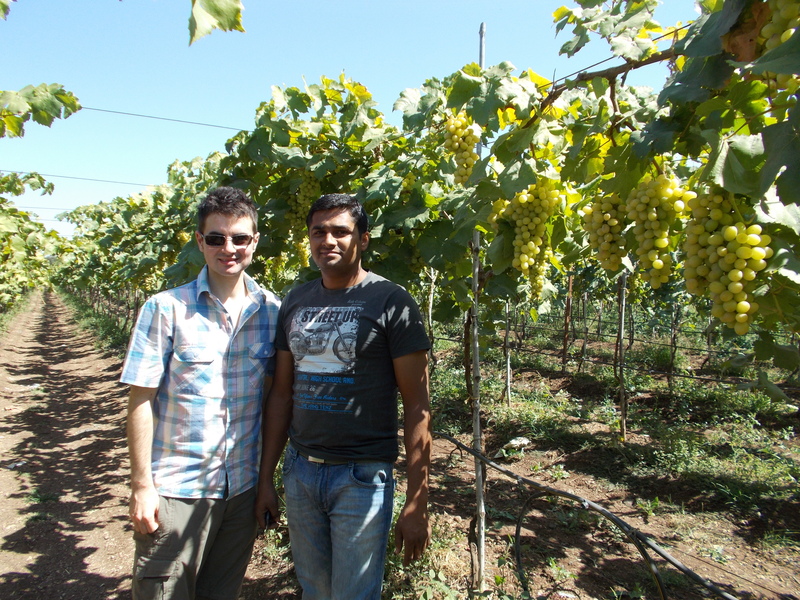 As well as being the major centre of wine production in India, Nasik is also famous as a site of religious pilgrimage. In the Ramayana, Lord Ram lived in Nasik while in exile from his kingdom in Ayodhya, and his wife Sita was abducted by Ravan, King of Sri Lanka, from nearby caves. Nasik is also one of the four sites of the Kumbh Mela, the largest religious gathering on earth, where Hindu pilgrims gather to bathe en masse in a sacred river. 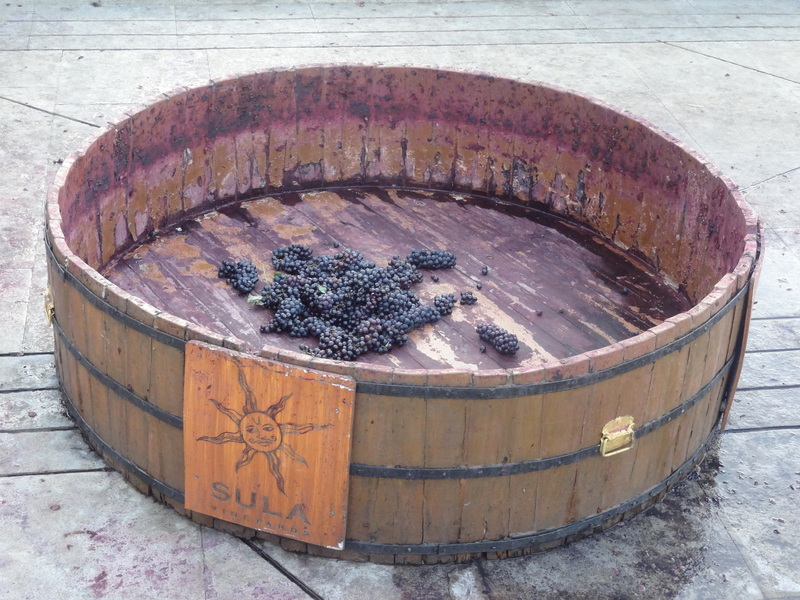 We went around the Sula winery and up to the terrace, which has a beautiful view out over the vineyards and the city. But the tours had stopped for the day, so we moved on to York winery, which specialises in red wine. Here we were given an out-of-hours and free tour of the wine-making process, because one of the tour guides was a friend of Parag’s friend. On the fourth day I caught a bus back from Nasik to Mumbai. Parag’s whole family had been extremely kind to me and when I left they gave me many presents, including a big box of grapes from the farm and a little statue of Lord Ganesh. The bus was very comfortable, air-conditioned, cheaper than the train and had a film playing during the journey. The woman beside me told me about her son whom she was going to visit in Mumbai, and who had once been in the UK. She gave me a chikoo, a fruit with a skin like a pear but completely round. I had never seen one before. The bus drove from the northern outskirts of Mumbai through the suburbs, and eventually I was back in Bandra. After the quietness of the fields, the noise of the biggest city in India hit me all over again as I stepped out into its hot, loud embrace. Thank you so much Stacey, I’m really glad you’re enjoying the posts! I’m pleased they are facilitating a bit of escapism! Thank you, Laura! I know what you mean, I kept being impressed by the sheer practicality of hewing these caves out of the rock, in 300-500 BC – incredible really. Great photos. Nasik should be on my travel list. Thanks for the title suggestions. I’ve gotten some really good ones so far. Thanks for reading and commenting, Nancy! 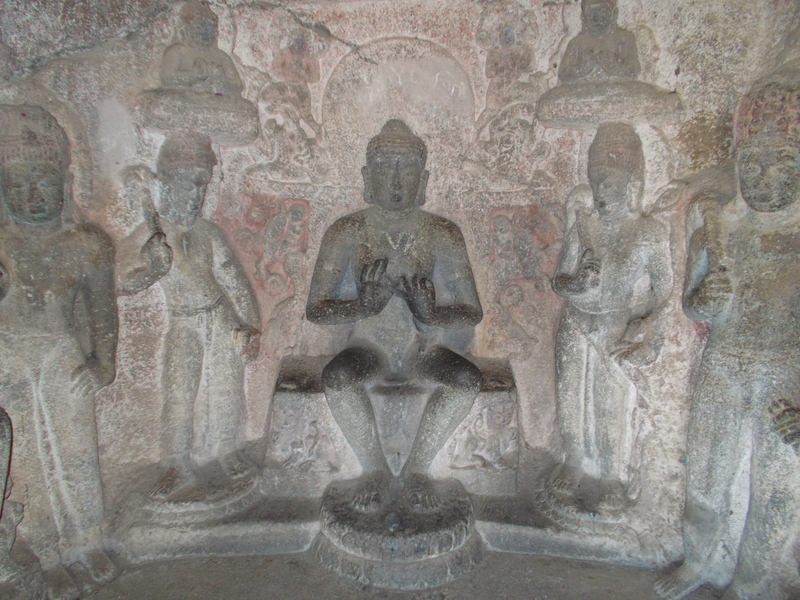 There are many ancient and spiritual caves in Maharashtra, and yes Nasik also has the advantage of the vineyards, with plentiful grapes and wine! Good luck with the title, and with launching your book!